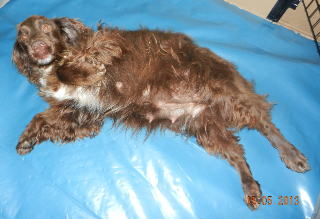 Both Hips & Eyes have been checked by specialist Vets, but not officially by the BVA. 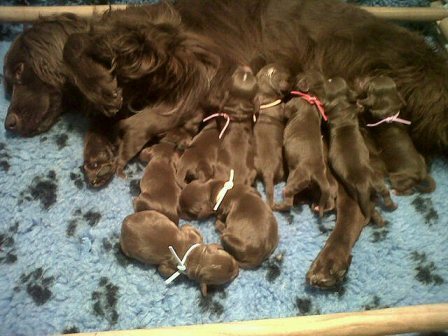 Teal will not be bred from any more due to both her age & also the fact that she has always had such large litters so we think she has done enough now. She will however continue to work on our Shoot here. 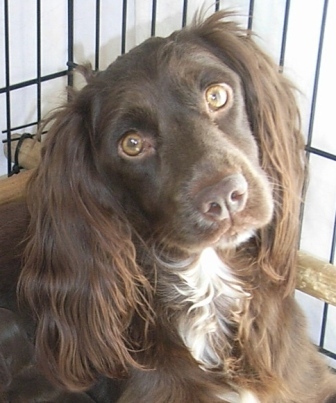 Teal like her full but older sister Tillie is 1/4 Sussex Spaniel & 3/4 Working Cocker Spaniel. The above 3 photos were taken in August by Kirstie Halliday. Teal had recently had her trim ready for the Shooting Season. 2015 Summer trim time. 1 Saggy Teal who loves being groomed & the finished result. Now she wont pick up quite so many burs on the shoot, hopefully ! 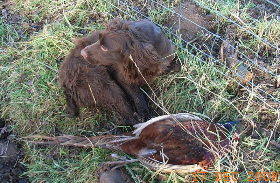 Teal is Rich's best beating dog who he feels lost without, she was never kept to be a picking up dog and it was not till she was out on her 3rd season beating that she came across a hen Pheasant & decided to retrieve it to Rich. 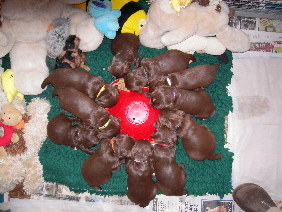 Teal has never had a litter at any other time than in the summer months, but then only alternate years, the year in-between is when Tillie her full but elder full sister has had a litter on the in-between years. They are now both retired from breeding. 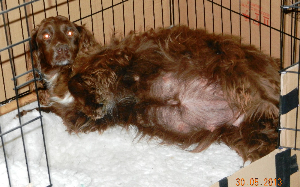 Poor girl she looks fit to pop & she had another 3 weeks to go according to her dates !But look at her now just days before having 12 ! 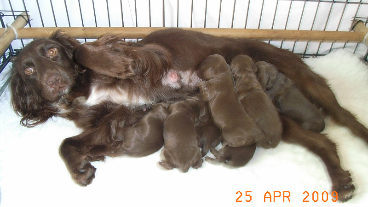 Teal is a lovely natured little girl & for her first litter she was mated to Wilts Flake, a first cross between a Sussex Spaniel & a Working Cocker & all her puppies were Chocolate, hence the coloured collars so we could tell the difference between them all, although a few had a white bib like Teal. 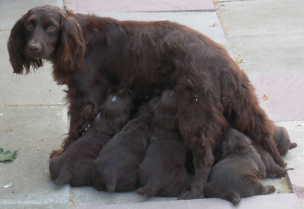 She is a wonderful mother & extremely long suffering ! We helped her out a lot as they got older ! 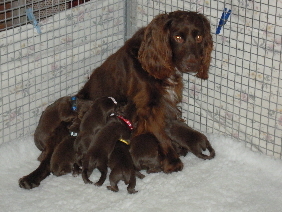 Her first litter was not as large as the second & 3rd litters thankfully ! 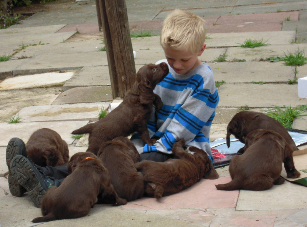 Grandson Jack helping with socializing the pups with children. Teal out on the Shoot and watching proceedings during her first Shooting Season.